$1200ish max budget. Here Is what I picked, but I have not built a computer in 4 years. I plan to overclock the E6600 to 3.2Ghz. I already have a power supply and case. $260---22" Monitor: ?not sure which? $35----Shipping If I buy all at newegg. Can I do any better for these monies? I'd vote for a better cooler like the Thermalright Ultra-120 or comperable performing one. Not saying this one isn't good but if you are planning to overclock you will want the best cooler you can get. Trust me unloaded my Arctic Cooler Freezer Pro 7 for the U-120 so that was money down the drain. Are you planning to OC? haha I should ask that first. They are overclocked pretty well from factory and run like a wild banshee. Thanks for the reply! I do plan to overclock, air cool, and game. I was looking at Zalman for a heatsink until I read the overclocking C2D guide 1.1. They listed these heatsinks. I picked one pretty high on the list hoping the higher the better. Which one is the best? What about second? There is a number of coolers on this list. Hope it helps out. This chard shows their cooling ability during an excteme core2 overclock. For your video card Thermailright makes the HR-03 Plus cooler. I believe it is only supported for the gtx but it works with the gts with a small modification. I believe you just have to put a silicon washer on the backside or something so the one bracket doesnt touch a resister or something simple like that. Look at the reviews on newegg and there are alot of gts owners buying them. Its a GREAT cooler and will yeild very cool temps. 20C drop is common. I got 20C drop on the version i have for my x1900xtx. It's worth it. Oh and if you get the Asus mobo. after you have gotten everything all working. remove the logo covers off the heatsinks. They do nothing but obstruct the airflow and prevent heat disipation. I saw a 1-2C difference just by removing them on my mobo temps. I have read comments that say my P180B (antec case) will hold the Thermalright Ultra-120 fine. I have decided to go with a 680i mobo, however, since it is nearly the same price. Any objections problems with overclocking or brand suggestions? The Thermalright Ultra-120 seems to have a problem with the EVGA 680i mobos. The EVGA mobo's chipset heatsink seems to occupy some of the space of this monstrous heatsink needs. This may be if there is a fan attached to the heatsinc though. Pros: Great cooler. It keeps my E6400 (OC to 3.6GHz) with Artic Silver 5 at 39C idle and around 51C load (P95 for a couple hours) temps. Pretty equal with the Tuniq Tower 120. Paired with a Thermaltake SmartFan LED (34-93CFM). Works great. Cons: It is huge. The monster, on a eVGA 680i, hits the NB/MCH Heatsink. In an Antec 900, the side fan won't mount properly with the Ultra 120 installed. The top posts of the fan need to be clipped off to fit. Also, it needs a fan to be any good for OC. Other Thoughts: Thermalright just came out with the Ultra 120 Plus/Extreme. 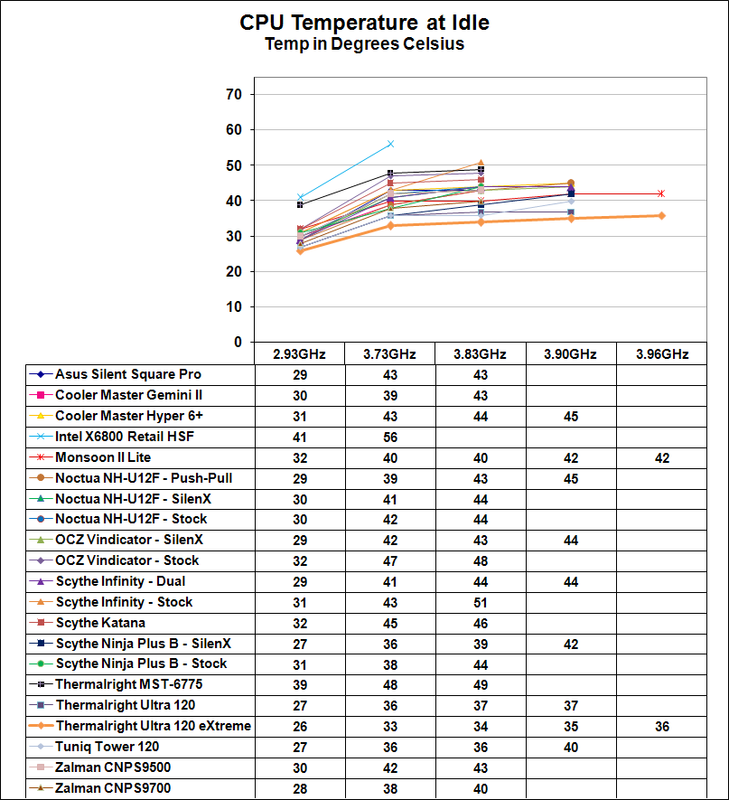 It has 2 more heatpipes and outperforms the Tuniq Tower 120 and the Ultra 120 by a few degrees. Is there anybody with an EVGA 680i mobo and the Thermalright Ultra-120? I have also read reviews of the 120's weight bending the mobo? This does not seem possible..? Are you planning to SLI at all? If so this is a good board. If not or do not have the intention to. The Gigabyte DS3 is a sure fire winner. The price is good, the overclock ability is unmatched, and it's STABLE as all hell. The only downside is it has only one PCIe port. The newer versions are 1333FSB ready and quad core ready so they are future proof. They don't have all the bells and whistles as the Asus or many 680i boards but they cost $100. With that savings you could actually realocate your funds to a GTS 640MB and get better performance. I am all about shuffling the money around to get better parts in certain areas. Alot of the 680i boards are costly and on a budget could use the money elsewhere. Just a thought dude. My thought is if you aren't planning on SLI within 6-12 months, don't even get an sli board because by 12 months you can sell your card and get a better single card for the cost of adding a 2nd card. Also I read a review, I forget where but was reliable source, that all these current chipsets, the 965,975,650i, 680i, all perform basically equal with the same components. The only difference is features, that's all. They are all stable good chipsets that run pretty much head to head. So a $300 680I board would not out perform a $100 965 board. Is it safe to overclock ryzen 3 1200?